Safety standards offer a required guaranty of basic protection to the various participants (drivers, crew, track personnel, rescue team...). Sanctioning bodies or specialized non-profit entities establish safety standards and the tests a product must undergo to earn their safety label. Such tests consist in timed flame exposure, applied pressure on a product or its components, resistance to various impact types from different angles… Samples of each product (according to size, options, etc.) are sent by the manufacturers to test laboratories approved by the sanctioning bodies, certification being granted if the given product exceeds the required standards. Here is a summary of the most commonly used and most stringent standards for gloves. FIA: - 8856-2000: used in most high-level competitions in Europe, Asia and Australia. - 3.3/20: used in drag racing series. 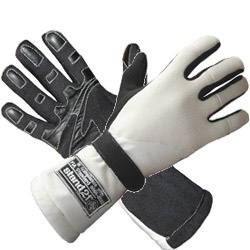 No expiration date for gloves under FIA 8856-2000 and SFI 3.3 standards. Gloves bearing FIA 86 certification are less and less accepted in numerous competitions and racing events. - Check yours racing gloves before use!